Aswan lies on what is probably the most magnificent section of the Nile River. The views form anywhere in this city are truly breathtaking. Enjoy the relaxed ambience that is this city’s trademark. What makes the scenery so extraordinary is that in and around Aswan, the desert closes in on the Nile Valley, enclosing the river in sand banks and rugged, exposed granite bedrock. Famous among the European elite for its fabulous winter climate, Aswan offers the perfect getaway from the pressures of everyday life. Extend your stay for a few days or a few weeks – it will certainly extend your pleasure. 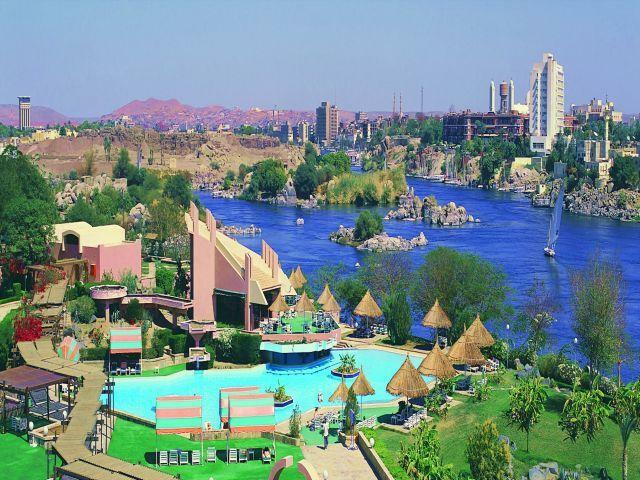 Unwind in the middle of the Nile at Pyramisa’s Isis Island Resort. You may never want to leave. Staying at Isis Island is almost like owning your own private oasis in the middle of the Nile. Its beautiful setting on an Aswan island accentuates the outdoor life and allows you to swim, play tennis, squash, croquet, and mini-golf. Its Rheumatoids Cure Center will soothe all our aches and pains away. Exclusive villas with a private swimming pool and garden are also available. Inside the hotel is an excellent health club, a host of restaurants, the biggest conference center in Aswan and a disco to dance the night away. The rooms and suites are luxurious with a balcony or terrace overlooking the Nile.